Last Tuesday, Justin Trudeau announced his bid for leader of the Liberal Party of Canada at a rally held in his riding of Papineau. The position has been vacant since former leader Michael Ignatieff, stepped down following the 2011 federal election. The Liberals lost a devastating 43 seats, leagues behind the New Democratic Party which is now the official opposition with 103 seats. The Liberal Party may be depending on Trudeau to seize the youth vote in Quebec, which has the second-highest percentage of voters aged 18-24 of any of the provinces, following Prince Edward Island, according to Elections Canada. In a survey done by The Concordian, students were polled about the current political landscape, including their opinions on Trudeau, the federal political parties, and the party leaders themselves. The results would either support or refute the claims that Trudeau is affecting the youth vote, and whether the NDP was at risk of being unseated in the next federal election. The answer was overwhelmingly positive. A total of 62 per cent of respondents said they are likely to vote Liberal in the next federal election, and 34 per cent said this was directly influenced by the fact that Trudeau could be the next leader of the party. It would seem that the senator-punching, Comic-Con-attending MP has struck a chord with Concordia students. While they might have faith in him to run the party, it seems not quite as many have faith in him to run the country. 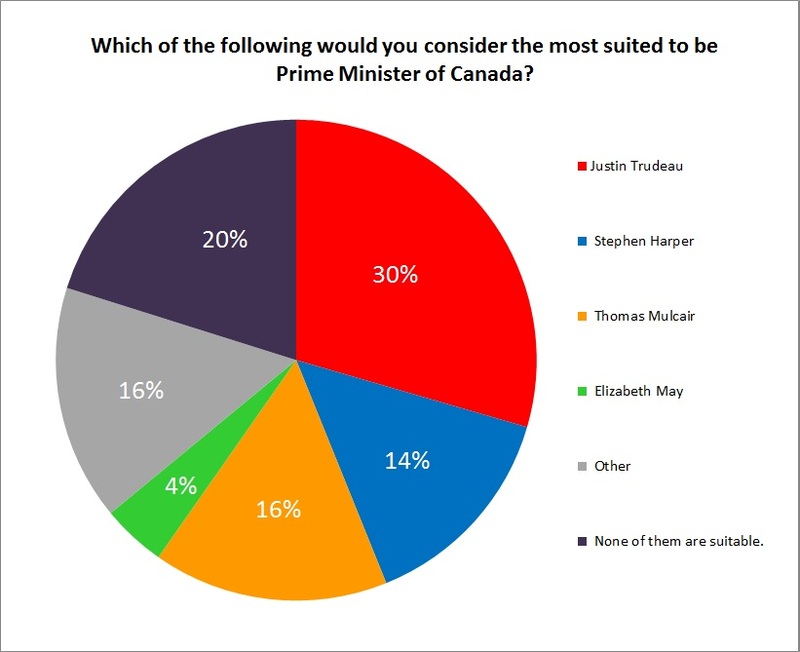 Only 30 per cent of respondents believe he is suitable to be Canada’s prime minister. While this is ahead of other leaders (Stephen Harper has 14 per cent, and Thomas Mulcair has 16 per cent), 20 per cent thought that none of them were suitable for the job. Political science students seemed to have more faith – 44 per cent of them said they believe that Trudeau would make a good prime minister. However, not a single one polled believed that Harper is suitable to lead our country. Among women, the faith in Harper is also on a sharp decline. While 20 per cent of men think that Harper is doing well, only 7 per cent of women agreed. This may be due to the fact that several members of Harper’s cabinet – including the women’s affairs minister – voted for a motion to study fetus rights, which would have re-opened the abortion debate. This does not mean the NDP is losing steam. Of those who said they won’t vote Liberal, 50 per cent of them said they will vote NDP (64 per cent coming from political science students). Behind Trudeau, Mulcair is in a solid second place as a prime minister pick. It should be noted that the next federal election is still three years away – plenty of time for Trudeau to soar as the poster-child of the party, or to crash and burn clinging onto his father’s coattails. Whether this popularity is a sign of a rising trend or a blip on the radar in the wake of his hype, is anybody’s guess.